It is an excellent source of vitamin K, and ounce for ounce broccoli has more calcium than a glass of milk, more vitamin C than an orange and more fiber than a slice of wheat bran bread. Broccoli, like other cruciferous vegetables, contains a healthy and natural fiber that works to help clear our intestinal tracts. But that's not all this magical fiber can do. When steamed, the components of this fiber are more easily able to bond with bile acids, which in turn allows them to be excreted along with the fiber. The result? Lower bad cholesterol to help keep your heart healthier. While not yet in the scrutiny of the medical community, exposure to potentially toxic substances in our food supply and environment, sub-par nutrition, use of prescription drugs and other lifestyle factors has a profound impact on our health. These cues trigger a reaction of our defense system to protect itself from potential damage. One of these defense mechanisms involve inflammation, which often works in our favor to help kill off potentially damaging molecules. But when this defense mechanism is triggered on a daily basis, it is a known as “chronic inflammation” and linked to a variety of disease including cancer and cardiovascular disease. Broccoli is a cruciferous vegetable that is loaded with fiber, allowing slow transit time while having a positive impact on digestion. This makes it a helpful food to include for weight loss. Eating it raw can help you feel fuller longer, while lightly steaming increases the action of the fiber. Another amazing compound found in broccoli is an organic sulphur called sulforaphane. This sulfphur, which is naturally found in other cruciferous vegetables too such as cauliflower and cabbage, is also abundant in broccoli sprouts. Not only has this compound proven to be antimicrobial, but it increases liver enzymes that help destroy cancer causing chemicals! (5) Add to this that sulforaphane has also been shown to slow tumor growth, kill cancer stem cells, and is linked to a positive impact on digestion, kidney function and hypertension. But to take advantage of this compound, your broccoli should be lightly steamed. Studies show that to enjoy the anti-cancer benefits one should consume at least ½ cup per day, or a 2 cup serving twice per week. Of course, more studies showed that eating more broccoli produced a wider variety of anti-cancer benefits such as protection from grilled meats and other environmental pollutants. The ranges shown in these studies were from 1.6 up to 3 cups per day. Bottom line? Include it when you can along with other cruciferous vegetables throughout your week. Try broccoli sprouts on salads and sandwiches for variety. When you do eat it, don't shy away from portion – go for the 1-2 cups, if you can. And remember, the more healthy foods we eat, the larger our deposit in our own, personal Bank of Health. (1) Ambrosone CB, Tang L. Cruciferous vegetable intake and cancer prevention: role of nutrigenetics. Cancer Prev Res (Phila Pa). 2009 Apr;2(4):298-300. 2009. (2) Angeloni C, Leoncini E, Malaguti M, et al. Modulation of phase II enzymes by sulforaphane: implications for its cardioprotective potential. J Agric Food Chem. 2009 Jun 24;57(12):5615-22. 2009. (3) Hu J, Straub J, Xiao D, et al. Phenethyl isothiocyanate, a cancer chemopreventive constituent of cruciferous vegetables, inhibits cap-dependent translation by regulating the level and phosphorylation of 4E-BP1. Cancer Res. 2007 Apr 15;67(8):3569-73. 2007. (4) Tang L, Zirpoli GR, Guru K et al. 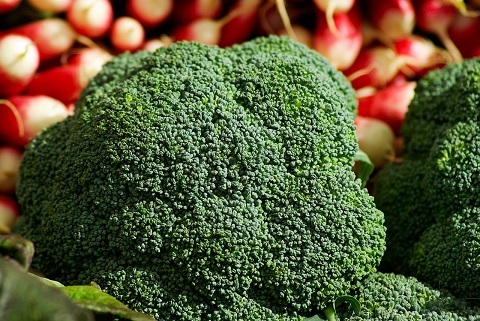 Consumption of Raw Cruciferous Vegetables is Inversely Associated with Bladder Cancer Risk. Cancer Res. 2007 Apr 15;67(8):3569-73. 2007. (5) Tarozzi A, Morroni F, Merlicco A, et al. Sulforaphane as an inducer of glutathione prevents oxidative stress-induced cell death in a dopaminergic-like neuroblastoma cell line. J Neurochem. 2009 Dec;111(5):1161-71. 2009.